One of the more difficult aspects of constructing a perceptual map is selecting the product attributes to use. Therefore, as a guide to help you, listed below are lots of ideas. 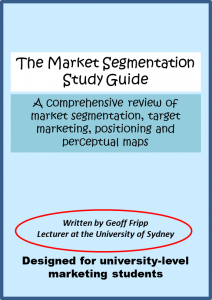 You can create more than one perceptual map by using multiple attribute sets – and this approach of using two or three perceptual maps in your assignment is more likely to generate insights about the marketplace and the competitive sets. Perceptual mapping is a technique that essentially visualizes the core marketing activity of segmentation, targeting and positioning (which is often referred to as the STP process). I have an eBook available in PDF that reviews these important topics for just $2.99. Click the book’s image to learn more.